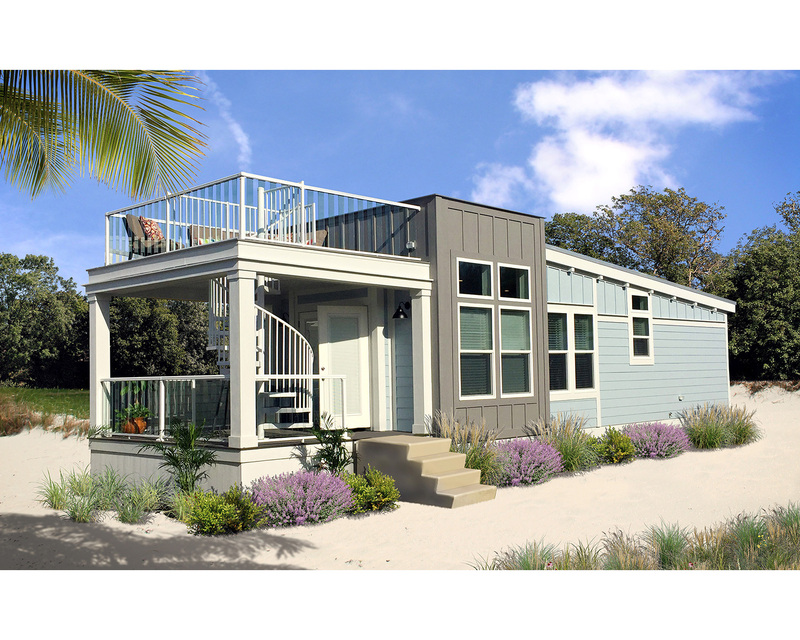 The design awards recognize excellence and encourage innovation in manufactured home design and production. 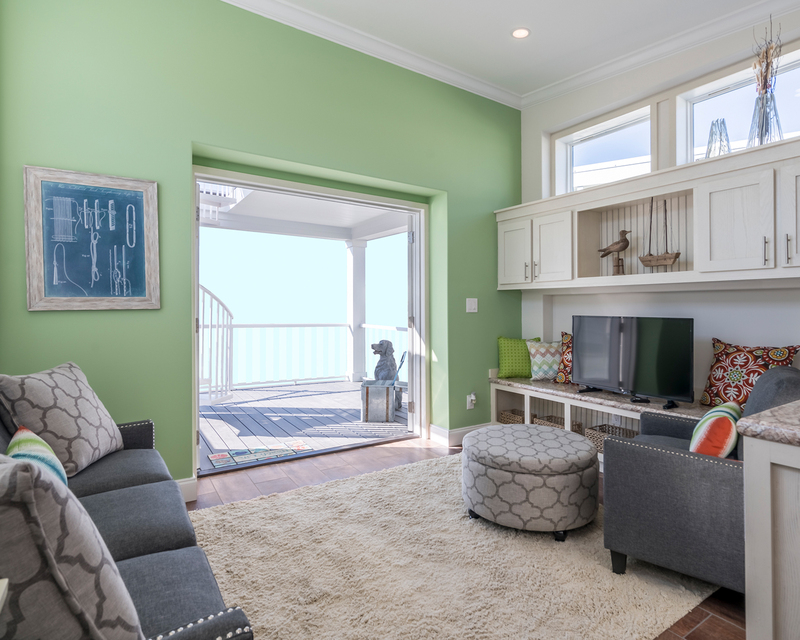 The interior design/home merchandising award recognizes excellence in functionality of space/problem solving, visual impact/color and balance for a unified look. 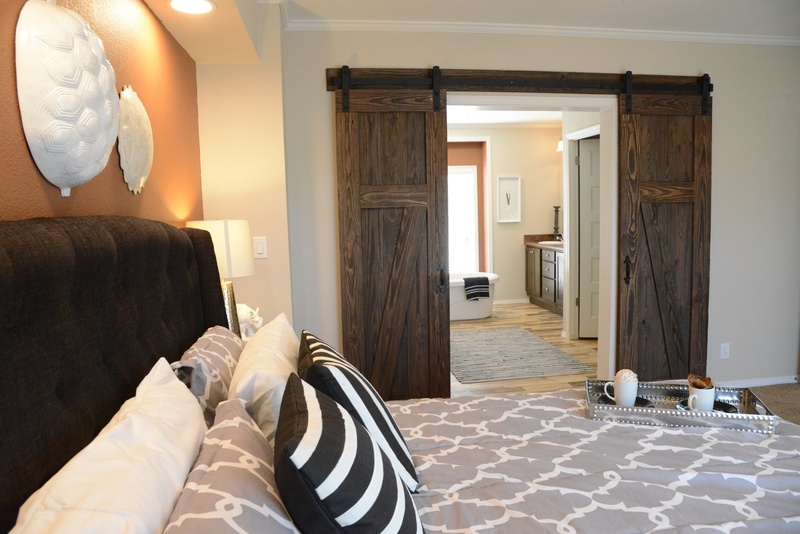 When designer for this award-winning home, Lifestylist® Suzanne Felber, received a call from retailer Clayton Homes of Desoto she couldn’t wait to start merchandising their model homes. 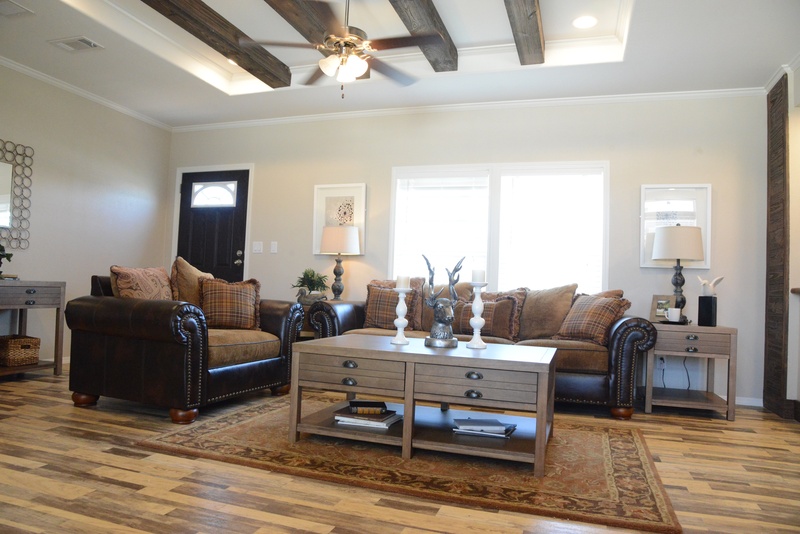 However, the challenge was that there was no new budget for decorating and furnishing this new model home. She had to work with furnishings and accessories from older model homes. For the 1,500-square foot Skyline model home, she dug through the sales center’s storage, 15 existing model homes, and her ofﬁce to find items to merchandise the home with the popular urban farmhouse look. In the end, she spent $18 to purchase a few towels, a plate and 2 napkins. 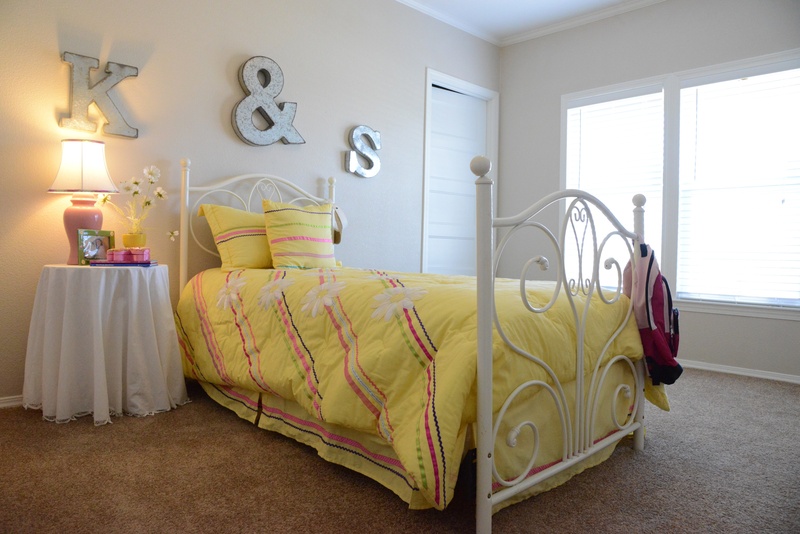 The decorated home quickly become a hit on social media on Houzz, Instagram and Pinterest. After two months the home was sold with the furniture. 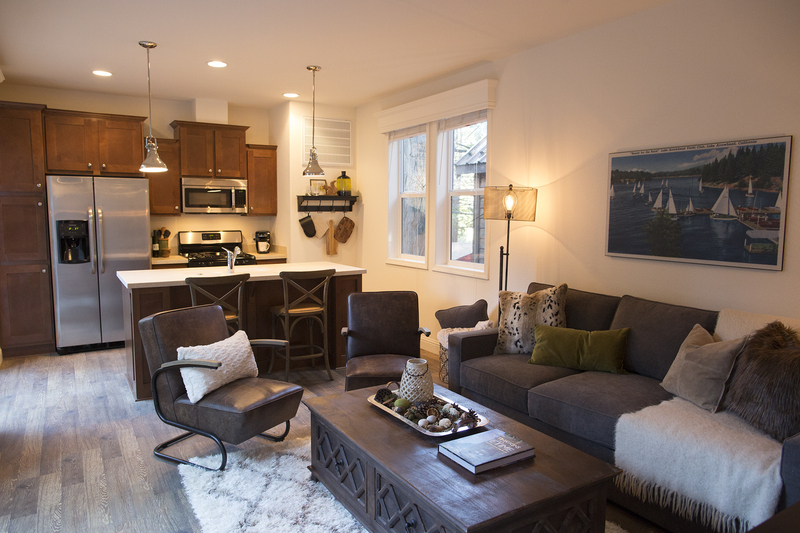 Felber showed how using repurposed materials that a budget-friendly home can be a victory for homebuyers and the retailer. 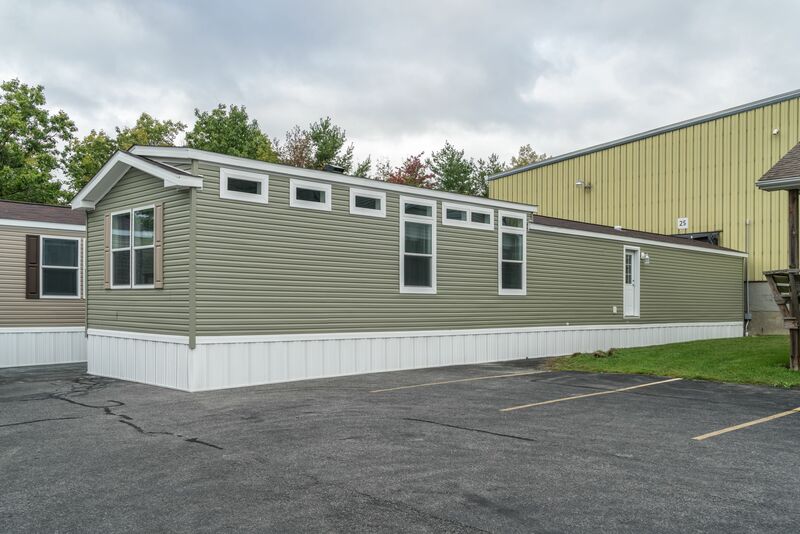 The Vista is a new 499-square foot small manufactured home introduced by Champion as part of a “Contemporary Cottage Series.” This new series designed with a modern look, both inside and out, features a mono slope roof system oriented front to back. The 1” rib metal roof terminates at a parapet which is used as a transition between the front porch and the balcony and the rest of the home. The parapet walls are accentuated with the gray contrast color. The interior takes full advantage of the mono sloped ceiling with staggered overhead cabinets. A continuous line of cabinets runs along the side wall in the kitchen and living space. 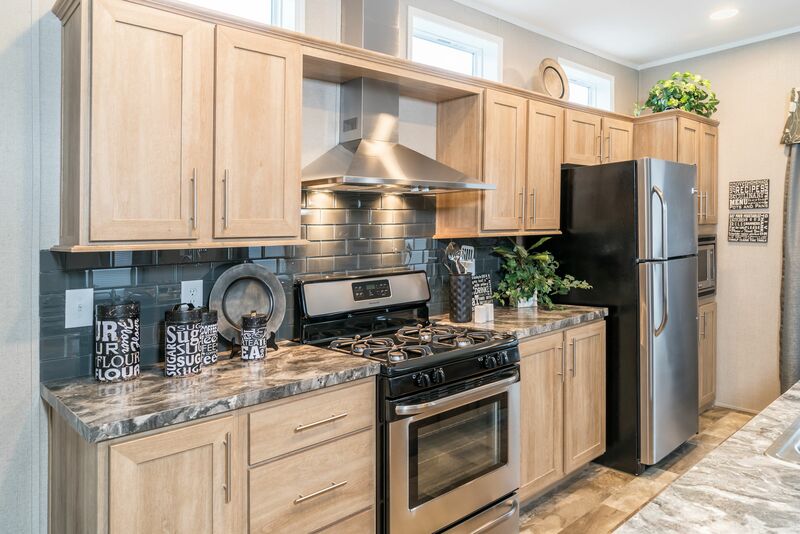 The kitchen features a 30-inch Euro range hood, wine cooler and a stainless steel farmhouse sink, and a built-in oven, cooktop and microwave. The most predominant exterior element is the spiral staircase leading to the upper balcony. A glass railing allows for a clear view from the upper balcony and the porch below. 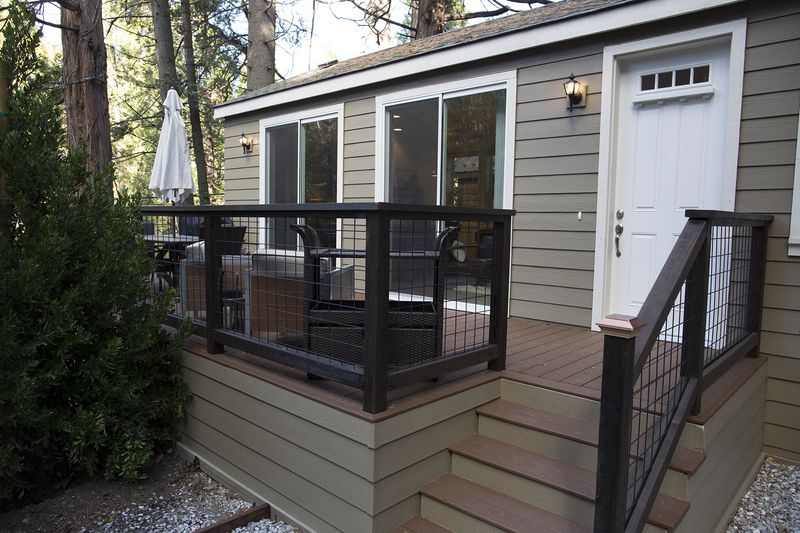 The upper balcony is drained towards the front of the unit and offers a spacious outdoor retreat. With a growing demand for high-end land-lease community living in Southern California, research identified an underserved niche of architecture and interior style. 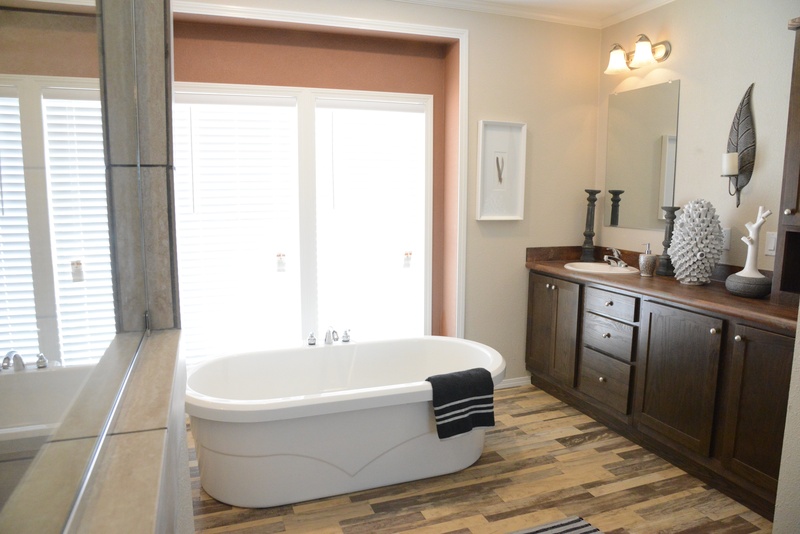 Thus, the “Contempo” series by Silvercrest Homes was born. 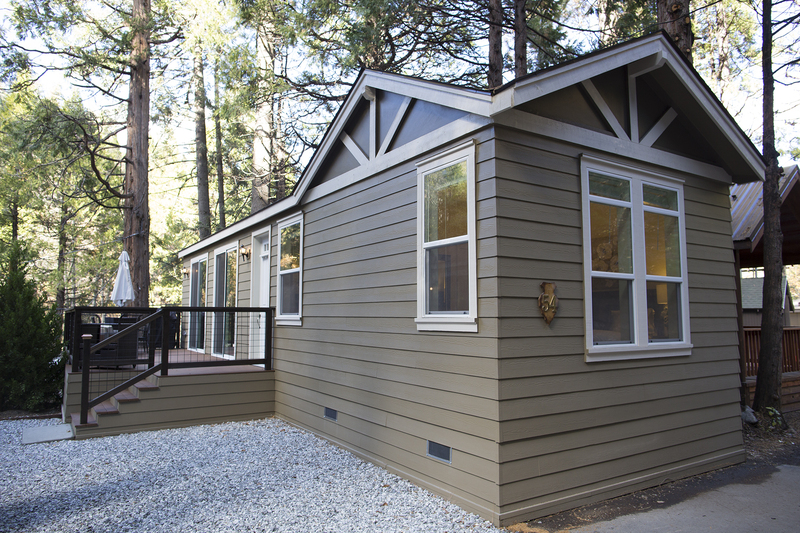 The “Contempo” series integrates a California modern exterior style by incorporating a transverse gable hipped roof, large eave overhangs and vista windows. 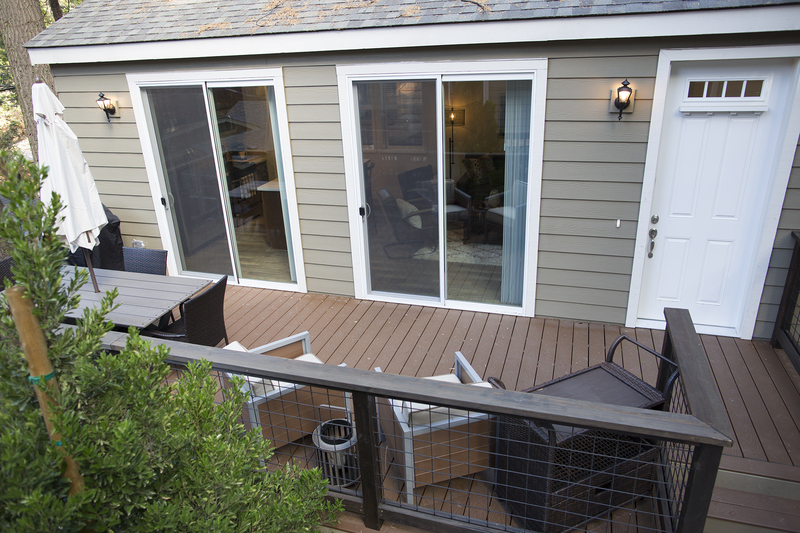 These features, along with an urban lap siding treatment, wire cable porch railing, and an 8 ft. front door with opaque “rainglass” created an immediate appeal for the identified market. 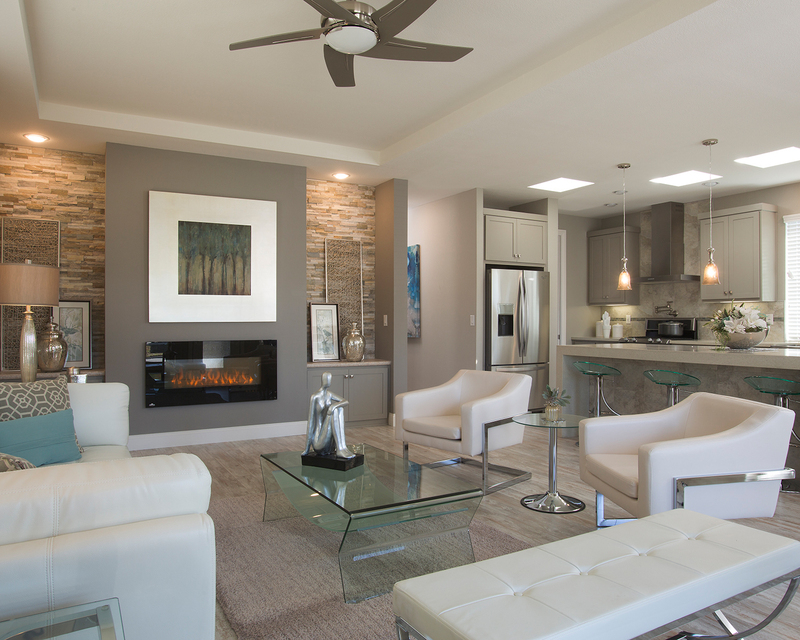 The interior design compliments the exterior by continuing an updated modern feel with clean lines and open spaces. A generous use of space in the great room and kitchen creates an open floor plan. An attractive linear fireplace placed in a contemporary entertainment center welcomes potential buyers as they enter. 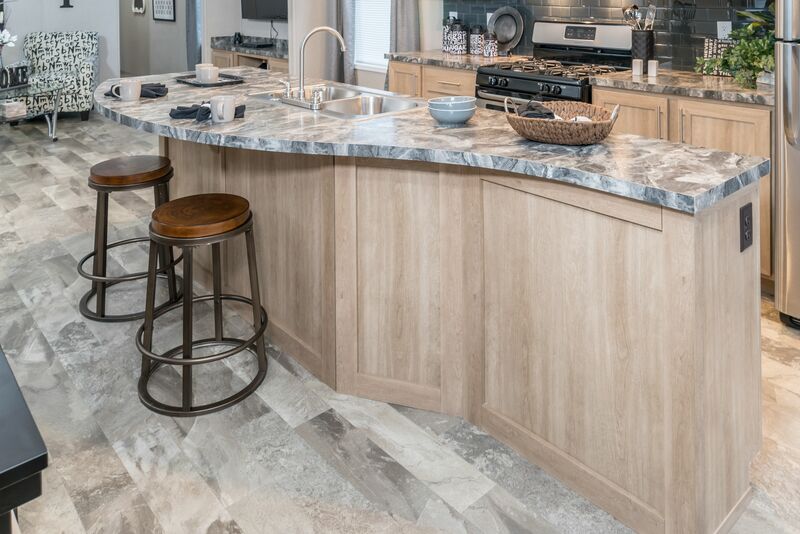 Adjacent to the great room is the waterfall kitchen island with a luxurious quartz top and sides. Appliances by Whirlpool®, including a slide out microwave drawer, create a sophisticated cooking and dining area. 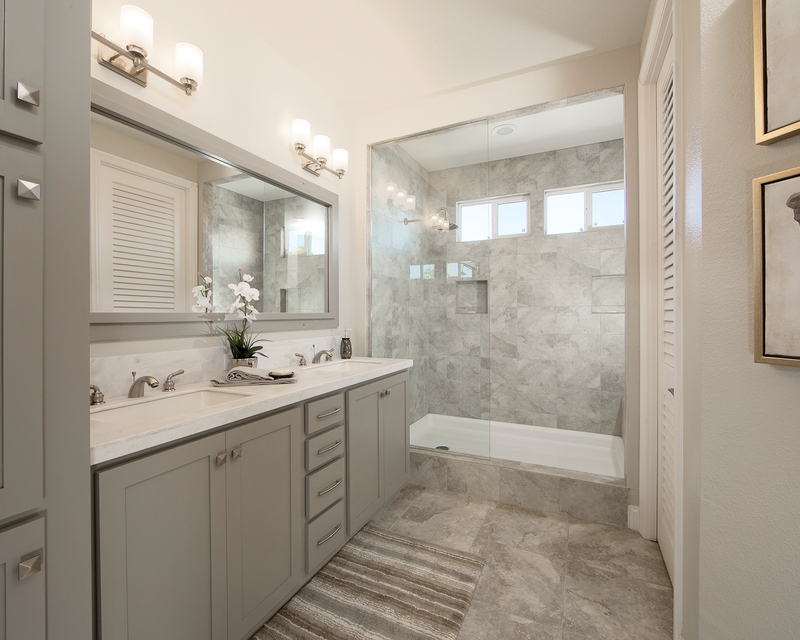 Throughout the home, cypress gray cabinetry and square bath sinks continue to reinforce the latest style as well as the oversized master suite with the popular “Rain Forest” walk-in shower. The market for Diamond Springs, an 1,854-square foot, 4 bedroom, 2 bathroom manufactured home, may fall into several categories. Empty-nesters might be attracted to the lower utility bills. Environmentally-minded homebuyers would focus on the sustainability aspect. 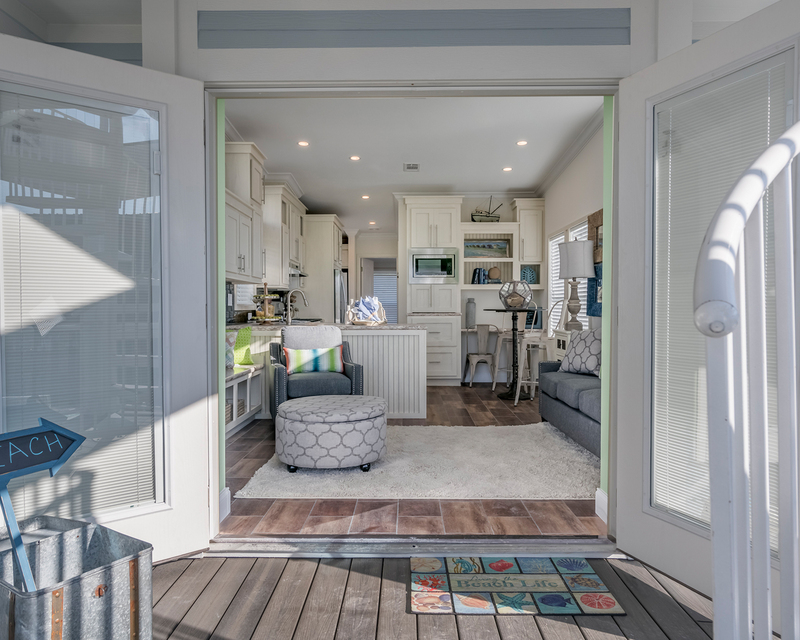 The home’s green design, innovative floor plan and architectural details are not typically seen in manufactured housing. Two architectural roof brackets constructed from heavy timber are positioned at an optimal angle over the bedroom and kitchen windows, so that they provide protection from the heat of the summer, but also allow the sun to warm the house in the winter when it is positioned lower in the sky. 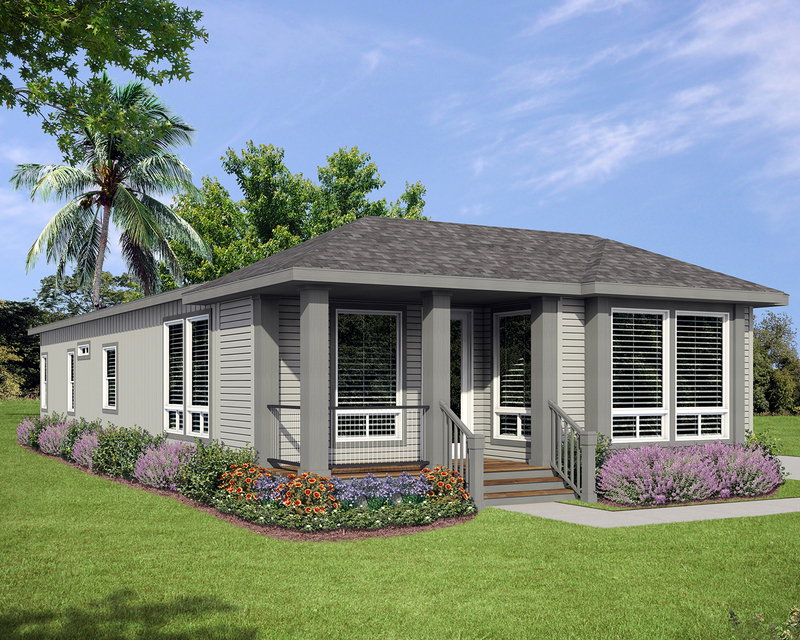 The exterior features a recessed entry with full view front door, gabel offsets, architectural shutters, front and side eaves, shake siding and gridded windows. 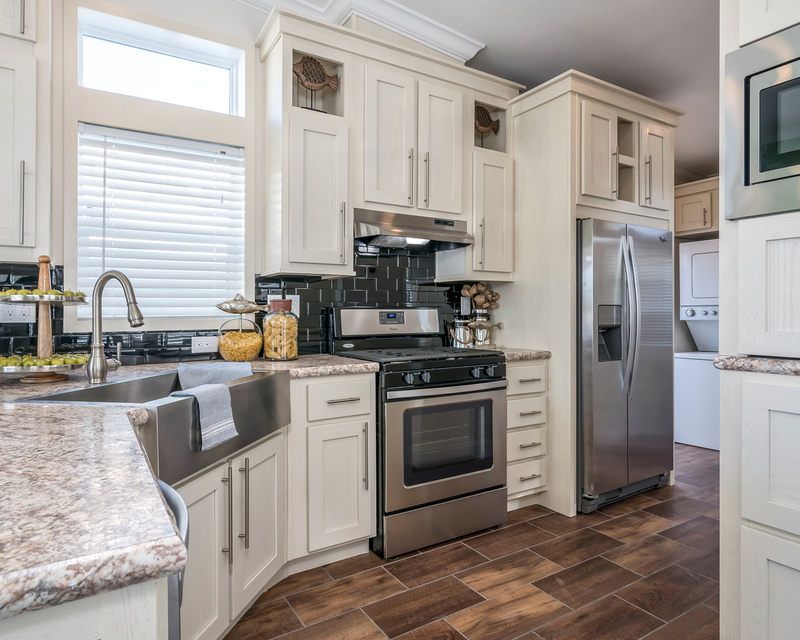 The interior is bright and open with unique windows, a large island with sink, recessed tray ceilings, ample storage and closet space. 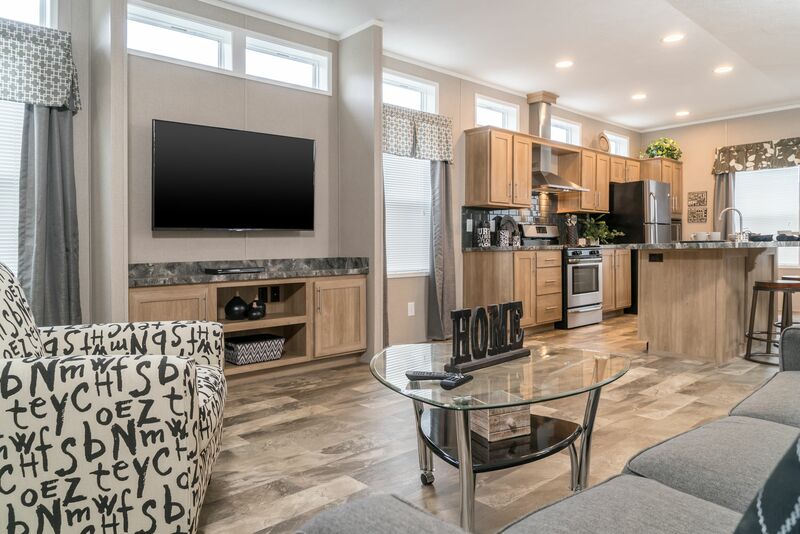 The Energy Star Qualified home provides more comfort and decreased outside noise with increased insulation, tightly sealed ducts and Energy Star windows. A Nest self-programming thermostat will remember the homeowner’s temperatures and program itself saving energy without effort. The home also includes features that save on lighting, water usage and improve indoor air quality. 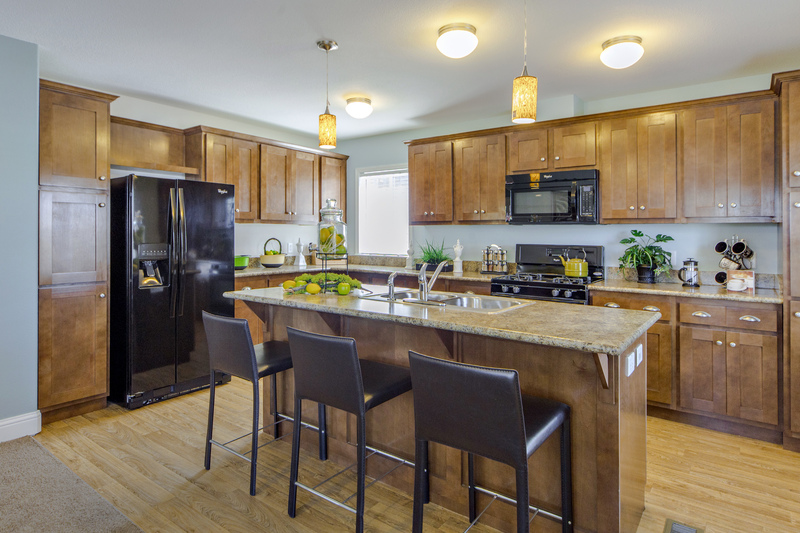 The Astro is a 3 bedroom, 2 bathroom home with an open living and kitchen area that is visible upon entering the home. 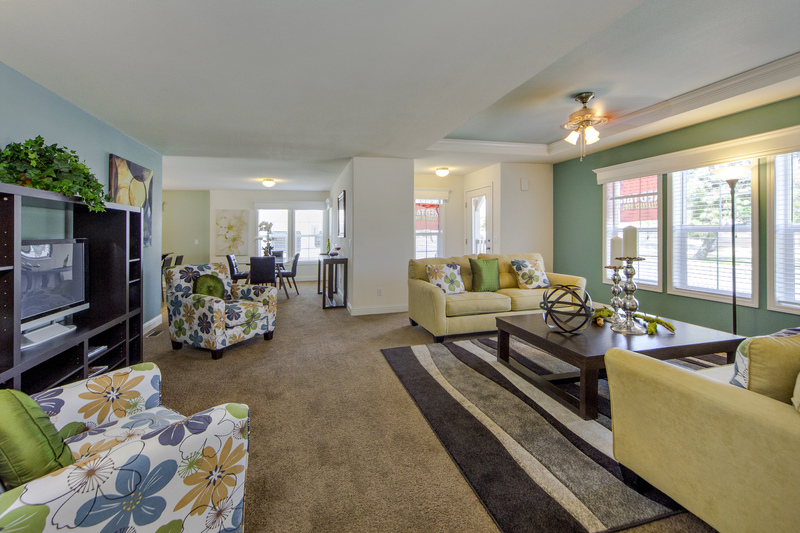 An optional entertainment center is located between two large windows giving needed space for furniture layout. A serpentine island adds spaciousness to the kitchen and eat-in space and gives the home a modern feel. The master bedroom features a walk-in closet and master bathroom with a tub/shower combination, linen closet and large vanity. Secondary bedrooms share the second bathroom and the washer and dryer space is across from that bathroom’s entrance. 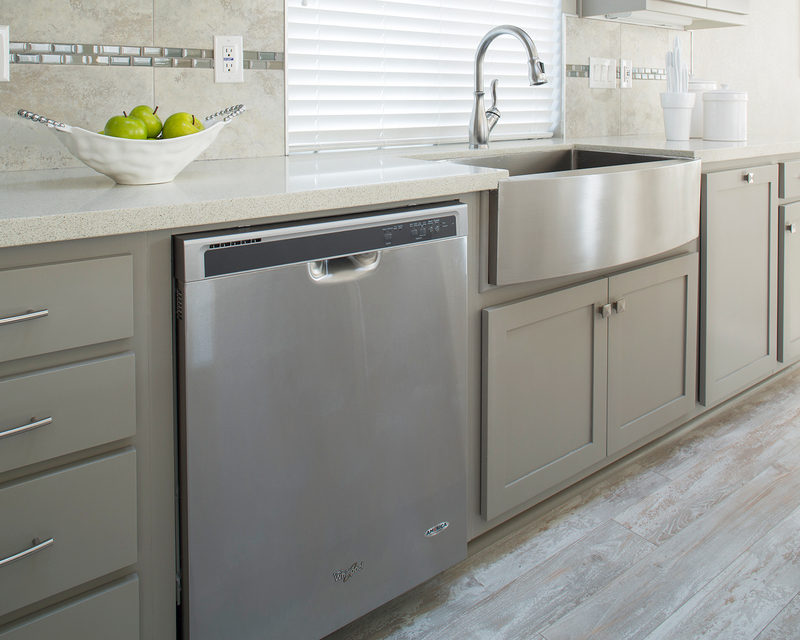 Brands such as Frigidaire, Nordyne and Shaw add quality to the home, while including many features as standard options creates value for the homebuyer. All the while, homebuyers also have the flexibility to customize the home to fit their likes and needs. 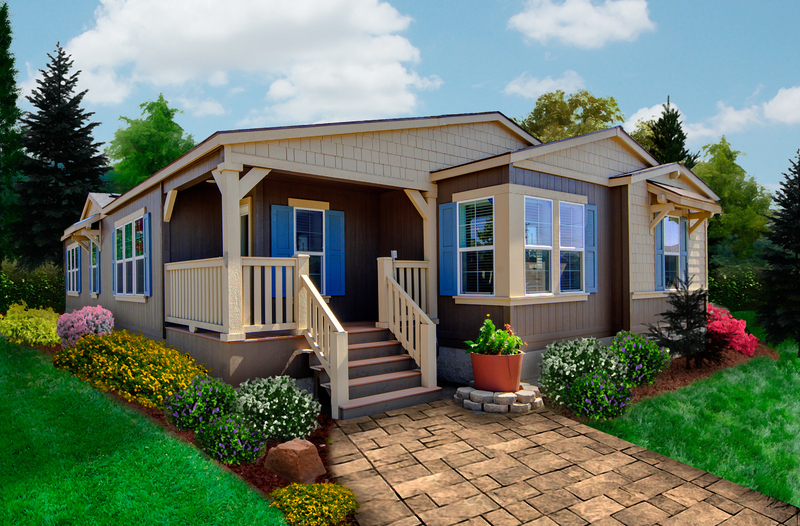 The Cedar Ridge is a single-section, 594-square foot, 1 bedroom, 1 bathroom home geared toward first time homebuyers, eco-minded individuals or retirees wishing to downsize to a smaller, more manageable and affordable home. Consumers are interested in this movement for many reasons, but the most popular are environmental or financial concerns and seeking more time and freedom. The Cedar Ridge captures the essence of this movement. The Cedar Ridge has several unique architectural and design features. The exterior has a steep 6/12 roof pitch and the siding is horizontal giving a cottage look. Tall vinyl framed windows with several transoms provide abundant light and a modern look. A charming 8-foot tall craftsman front door provides a dramatic entrance to the small home. The interior has 9-foot ceilings, a recessed tray ceiling in the bedroom to add the feeling of spaciousness, room for a stacked washer and dryer (an unexpected convenience in a home of this size), and two 8-foot sliding glass doors in the living room which provide additional natural light, views to the outdoors and access to the outdoor deck. 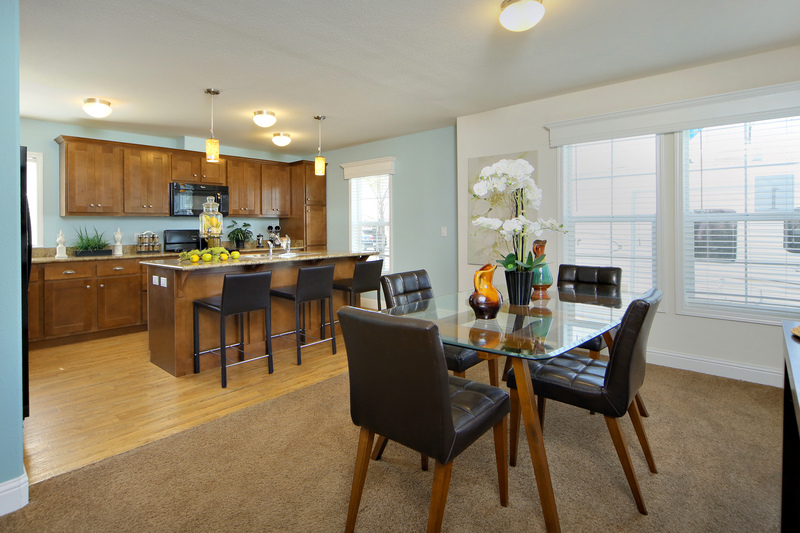 The Energy Star qualified home also will provide lower ownership cost.